Editor’s Note: I’m pleased to welcome the newest addition to the BHS Help Desk-senior John Vallerand. For his debut post, John has put together a list of helpful iPad tips as well as a few hidden features of the iPhone. Unlock it – press the Home button or the Sleep/Wake button, then drag the slider that appears onscreen. 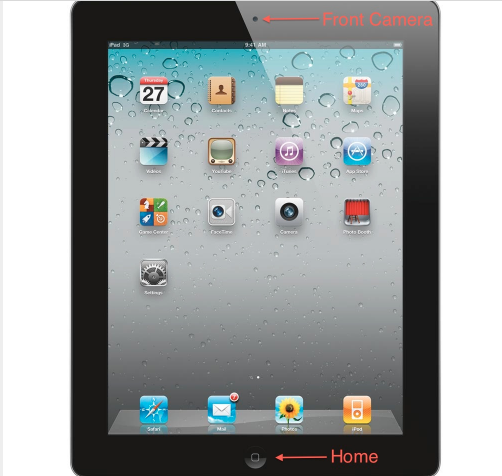 Turn iPad on – Hold down the Sleep/Wake button until the Apple logo appears. Turn iPad off – Hold down the Sleep/Wake button for a few seconds until the red slider appears onscreen, then drag the slider. Set the auto-lock time – Go to Settings > General > Auto-Lock. – your iPad will lock itself after two minutes. Go to Settings > General > About here you will find the “good stuff” including the numbers of songs, videos, photos, apps, etc. You can also find out the model and serial number of your iPad which is important in case you ever need to file an insurance claim (the model and serial number is also located on the back of your iPad). Below is list of the buttons on your iPad and what each one does as well as instructions on how to use them. Have more questions about your device? We hope to see you down at the Help Desk soon!